Bamboos are divided into clumpers or runners, which can have a major impact on how well behaved they will be in your garden. 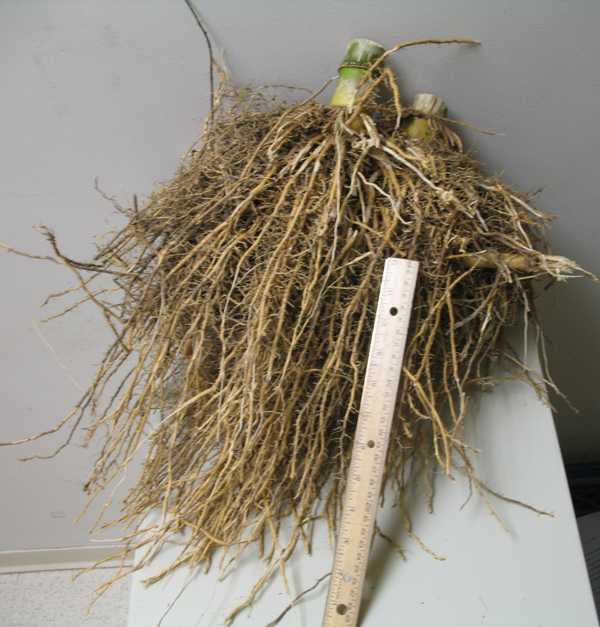 Clumping types have a very short rhizomatous root structure and are incapable of expanding more than a few inches a year and will generally form discrete clumps. The clumps slowly enlarge as new culms emerge every year, and may require anywhere from 2-10 feet or more of space in order to reach their mature height, depending on species. Except for species of the genus Fargesia, the clumpers tend to be less cold-hardy than runners. Clumping bamboos generally do not require control. They may be shaped by removing new shoots at soil level when they begin to encroach more closely on nearby structures. Running types spread by sending out underground runners, or rhizomes, which sometimes emerge far from the parent plant. Runners fill in the spaces between plantings faster, making them ideal for screens, hedges, and the popular open grove look. Runners may be contained, as described below, since the rhizomes grow sideways at a depth of about 2-18 inches. Many are cold-hardy. Following are some strategies you can try for containing and eradicating running bamboos. 1. Contain the running bamboo with a physical barrier. 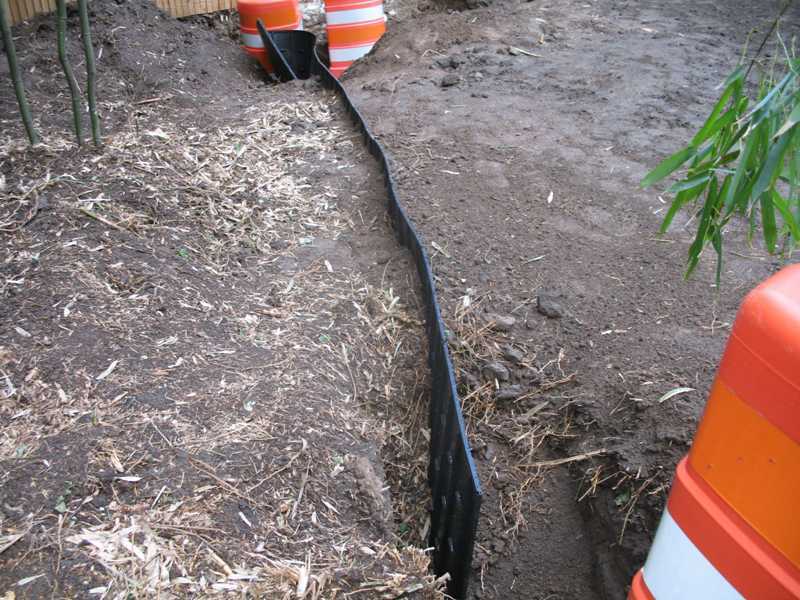 The safest containment methods for running bamboo are 1) Planting in containers, or 2) Installing a vertical 30-40 mil thick plastic rhizome barrier 22-30 inches deep around the perimeter of the area in which the bamboo is to be contained. The advantage of this material is that even large plantings of bamboo can be surrounded with a single length of plastic, requiring only one seam. 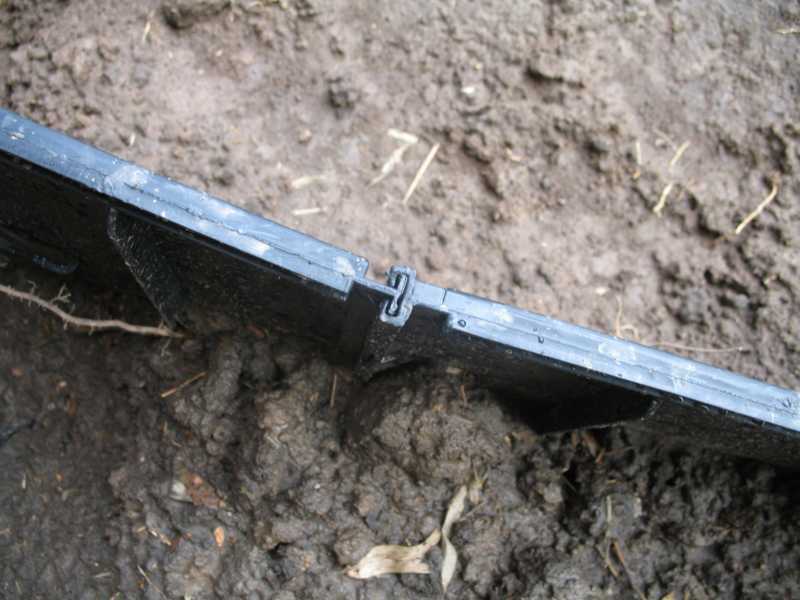 It is preferable to cement (which often develops cracks), or metal (which rusts and requires many seams), is less expensive, and lasts 20-30 years if installed properly. Please refer to The American Bamboo Society for detailed installation instructions. 2. Cut off unwanted shoots. The active growth period usually lasts for only about 2 weeks every spring, then little or no additional new growth will occur until the following spring. Therefore, cut off any shoots you don’t want but remember all of the culms (stalks) of bamboo in a clump or grove are interconnected underground by rhizomes (underground stems). New shoots will grow again next year. If the bamboo in your yard comes from another’s yard, separate your grove from his by cutting the connecting rhizomes, which are usually quite shallow. If this isn’t done, and his part is healthy and vigorous, the rhizomes in your part will still be supported by the photosynthesis in the leaves of his part, and your efforts will be in vain. Cutting rhizomes with a spade or a saw will do the trick if it is done every year. If the growth is old, you may need to use a mattock or a digging bar the first time. Digging a ditch and putting in a barrier is a more permanent solution. 3. Mow unwanted shoots in lawn areas. If the bamboo is surrounded by lawn, then just mow frequently over the area where the bamboo is coming up during the spring shooting season. 4. Many years of effort may be needed to eradicate running bamboo. 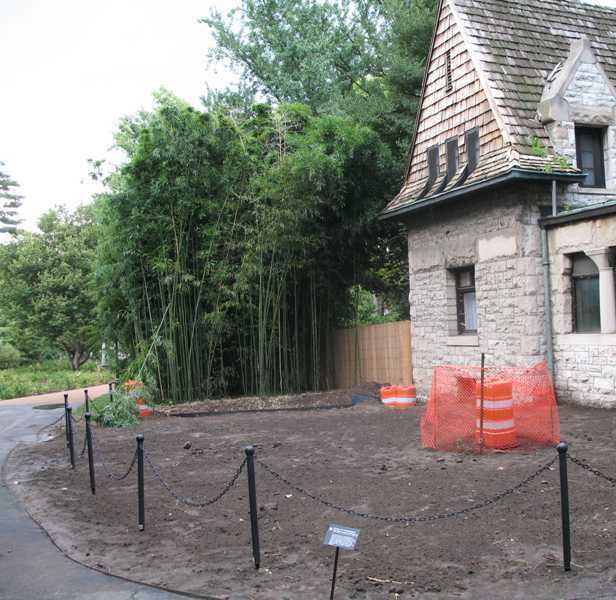 Begin by either digging as much of the root system out as possible – no easy job – or cutting the bamboo to the ground and then continue by following up with regular removal. New shoots will come up from the rhizomes. Break them off or cut them off with pruning shears. Keep doing this until no more shoots come up. This will exhaust the energy stored in the rhizomes underground. Without green leaves to photosynthesize and produce new energy, they will no longer be able to send up new shoots. The rhizomes will be left behind, but will rot away. This is a slow, labor intensive process. 5. Using chemical weed killers may be helpful. Be warned bamboo doesn't respond well to any herbicide currently on the market. If glyphosate (Round Up) is used, remember it is taken in through the leaves only, and it must be applied in an undiluted form. Often the plants will still re-shoot. Some have used a “cut and paste method” with some success. Each culm is cut to within 6” of the ground and immediately (within 15 seconds) painted with concentrated glyphosate. It has been noted that imazapyr (Arsenal) is more effective on bamboo than glyphosate. However, imazapyr has a great deal of foliar and soil activity and can be very harmful to nearby hardwood trees, shrubs, and all grasses if their roots extend into the vicinity of the application. Therefore, if the bamboo is growing near any desirable plant species, imazapyr should not be used. Glyphosate does not have soil activity and will only kill plants that are contacted with the spray solution. This makes glyphosate a more useful herbicide option for most areas where bamboo grows. It is important to note that one application of glyphosate will not eradicate bamboo. It will most likely be necessary to mow and spray as many as 4 times for complete bamboo control to be achieved. Persistence is key when targeting running bamboo. Strategies 1, 2, 3, and 4 are strictly organic approaches. It took a backhoe to remove the grove of yellow bamboo (Phyllostachys) rampantly growing between the house and the path. The roots of this yellow bamboo Phyllostachys were over 18 inches deep. A barrier to control running bamboo must be interlocking otherwise the rhizomes will get through the barrier at every joint. 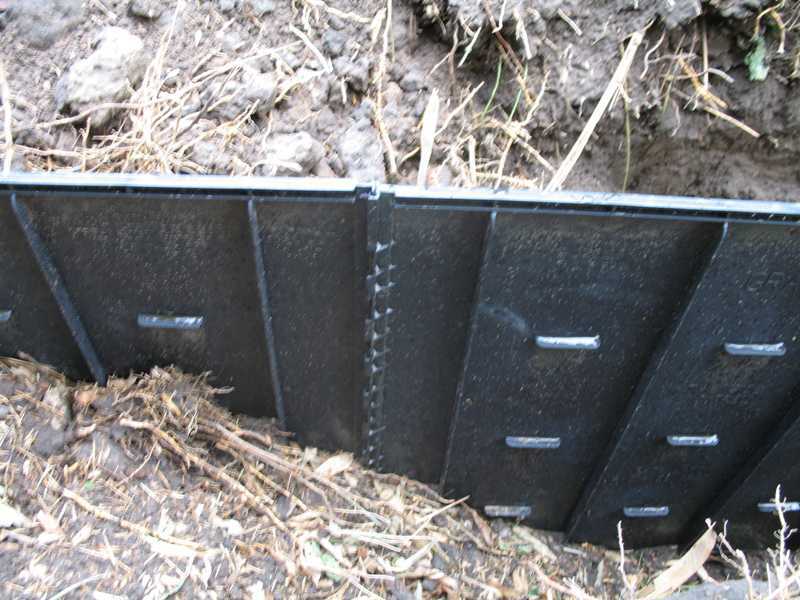 Once installed, the top of the control barrier should be an inch or two above the surface of the finished grade.